This chapter explains how the bureacratic process worked to enable people to buy land under “Conditional Purchase” and the process of improvements and inspections that enabled them to obtain title to the land. A Parish map showing J. 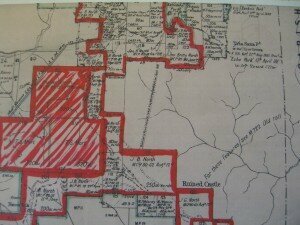 B. North’s land holdings, and the lease for the Ropeway across the Jamison Valley. Up till now we did not know if North had acquired a lease for the ropeway track. p3: The writer deliberately used the phrase “At the feet of these cliffs” because the bases of the cliffs are not at the same level. It has been suggested that the sentence should read ‘At the foot of these cliffs’, but I think this conveys an incorrect sense.